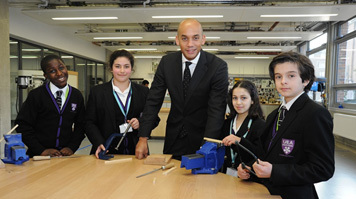 London South Bank University (LSBU) welcomed Shadow Business, Innovation & Skills Secretary Chuka Umunna MP as he officially opened the University Academy of Engineering South Bank - a purpose-built learning environment in Science, Technology, Engineering and Maths (STEM) for young people aged 11-19. University Academy of Engineering South Bank is sponsored by LSBU and offers a purpose built learning environment to deliver a curriculum focused on Engineering within the STEM framework. The Academy is the only one of its type in South London, and the sponsorship of LSBU has resulted in a curriculum that is professionally orientated and industry focused while designed to foster confidence and encourage enterprise. Speaking at the official opening, Chuka Umunna MP pointed out the diversity of cultures within South London which can be capitalised upon to drive UK industry internationally if young people are given much needed STEM education. The Member of Parliament for Streatham added: "The challenge that we face is not simply to change lives now, but to make sure our young people have a future in the face of increasing globalisation. We have skills shortages in STEM and the primary focus of institutions such as this is to address that." The Shadow Secretary of State for Business Innovation & Skills praised the development of the Academy as an "extraordinary feat," and welcomed LSBU's commitment to addressing this through a partnership model of working. LSBU Vice Chancellor David Phoenix commented: "LSBU is delighted to sponsor University Academy of Engineering South Bank. This academy with purpose built laboratory and engineering facilities offers outstanding learning facilities for young people in our community, Ensuring they have a rounded education whilst also preparing them for tomorrows advanced technologies world." University Academy of Engineering South Bank Principal Jane Rowlands added: "Our partnership with LSBU allows our students to benefit from the University's extensive employer links and engineering facilities – giving them the best chance of a successful future."